Nature, A Community Show, Group Show at the Bruce S. Kershner Art Gallery, Fairfield Library, CT, February 4th - March 3rd. New Members Exhibit, Silvermine Guild Galleries, New Canaan, CT. Reception Sunday, January 13, 2 - 4 pm. January 13th - February 6th. Silvermine Gallery, New Canaan, CT. Artist Reception Sunday, November 18th 2 - 4 p.m. Exhibit runs from November 18 - December 20th. The Artist's View; Traveling the Merritt Parkway, Solo, Invited and Curated by Gail Ingis, Lockwood-Mathews Mansion Museum, Norwalk, CT, Oct. 10, 2018 - Jan. 6, 2019. Artist's Reception Dec. 6th, 5:30 - 7:30 pm. Viewing for public begins on Oct. 17 from 12 - 4 pm. 41st Annual Juried Exhibition, Juried by Denise Bibro of Denise Bibro Fine Art in NYC, Ridgefield Guild of Artists, CT, Sept. 22 - October 31. Nor'Easter: 48th Annual Juried Exhibition at the New Britian Museum of American Art, CT, Juried by Stephanie Haboush Plunkett, Deputy Director and Chief Curator of the Norman Rockwell Museum, June 24 - July 17, Opening Reception June 24, 1 - 2:30 pm. Pop Up!, Group Show, Westport Arts Center, CT, March 7 - 9, Opening Reception March 9, 6 - 8 p.m. Living Color, Three Person Show, Keeler Tavern Gallery Barn, December 3 - 9. Tuesday - Saturday 11 am. - 3:30 pm. Small Joys Show at ARTWorks Gallery on the Green, Selected small work, Norwalk, CT. Opening Thursday, Nov. 30, 5 - 8 pm running through the holidays. Festive Home, Selected Paintings and Prints, Ridgefield Guild of Artists, 34 Halpin Lane, Ridgefield, CT. Opening night Friday, Nov. 17 . Show runs to Dec 23, 2017. Pop Up!, Three Day Group Show at the Westport Arts Center, CT, Reception Wednesday, November 15, 6 - 8 pm. Show runs November 15 - 18. Designers Celebrate the Arts, The Antique and Artisan Gallery, 69 Jefferson St, Stamford, CT. Thursday, October 26 from 6 - 8 pm. Selected Paintings from Inspired by Ridgefield Series at Cellar XV, Ridgefield, CT from October 9 - the Holidays. Ridgefield Guild of Artists 40th Annual Juried Exhibition, *2nd Prize for Blue, White, Aubergine and Amber, an oil over watercolor, sealed, 24 x 24 inches. Juror, Lisa Hayes Williams, Curatorial Assistant to the Director of The New Britain Museum of American Art. September 23 - October 22nd. 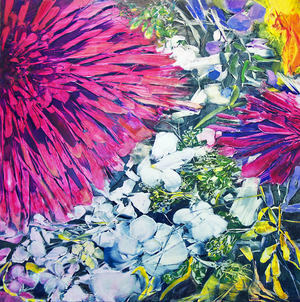 Blooms in Light, A Show of Contemporary Florals, The Sidewalk Gallery, Solo Show, 18 South Main St, Norwalk, CT 06854. June 25 - August 7. Ridgefield Guild of Artists Juried Member Show, Juried by Helen Kauder, Executive Director at Artspace in New Haven, CT. Opening Saturday, May 13 from 4 - 6 pm, show runs from May 13 - June 18. Ridgefield Guild of Artists Open Studio Day, Saturday, April 22. My studio will be open to those who buy tickets from the Guild, rgoa.org for information and tickets. Spectrum: 2017 Grayscale, Juried by Adrienne Ruger Conzelman of ARC Fine Art, Carriage Barn Arts Center, New Canaan, CT. Show runs April 22 - May 25. Pop Up! Westport Artist Collective Group Show, The Westport Arts Center, CT, April 6 - 8. Different Textures, Invited Five Artist Exhibition at Memorial Sloan Kettering Westchester, West Harrison, NY. Curated by Kimberlyn McKoy through Arts Westchester, NY. Feb. 27 - Sept. 30, Artist reception April 18, 6 - 7:30 pm. Reception March 31, 5 - 8 pm. Expressive Women of NAWA, Juried Show at the Ridgefield Library in conjunction with the National Association of Women Artists, NYC. 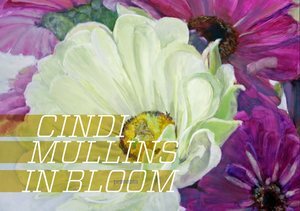 Curated by Cynthia Mullins, NAWA member, Jill Baratta, NAWA Exhibitions Chair and Laurie Bachmann, Ridgefield Library Adult Program Assistant. Opening Sunday, March 5th, 3pm. Show runs until March 30th. at Prince Street Gallery, 530 W 25th St, NYC 10001. Juror, Margaret O’Reilly, Executive Director and Curator of Fine Art, New Jersey State Museum. March 2nd, Opening Reception 5-8 pm, show runs from Feb. 28th - March 25th. Selected work at Festive Home @ the Ridgefield Guild of Artists, 34 Halpin Lane, Ridgefield, CT. Nov. 19 - Dec. 23, 2016. A Sight for Sore Eyes, an online juried show of the National Association of Women Artists. See it @ http://www.nawaonlinegallery.org/index.php, Oct. 10, 2016 - Jan. 1, 2017. 4-6 pm. at the Stamford Art Association, 39 Franklin St, Stamford, CT. Show runs until October 27. Juried by Michele Wijegoonaratna, PhD., Modern & Contemporary Art Department Research Associate, Metropolitan Museum of Art, NY. The Solstice, A Group Show of Four Artists, Opening June 10th 5-7 pm. Show runs from June 10th - June 19th. Juried by Gabriel de Guzman of Wave Hill Public Garden, Bronx, NY. Juried by Robbin Zella, director and curator at the Housatonic Museum of Art in Bridgeport, CT.